There have been enough talks about Samsung’s upcoming mid-range Galaxy A series (2019). The lineup is reported to offer as many as nine smartphones starting from entry-level Galaxy A10 to upper mid-range Galaxy A90. Samsung is yet to reveal the launch date of the devices, but rumours are it could happen towards the end of March or the beginning of April. Ahead of that, MySmartPrice has got hold of the specifications of three of the upcoming Galaxy A series smartphones. Starting with the Galaxy A10, it’ll be the most affordable smartphone in the lineup. The handset is tipped to arrive with a glossy plastic design with 6.2-inch Infinity-V display that bears HD+ resolution. The phone is likely to rock an octa-core Exynos 7884B chipset clocked at 1.6GHz under the hood. The chipset will reportedly be accompanied by 3GB and 32GB storage. For photography, the device may equip a single 13-megapixel primary sensor with f/1.9 aperture lens on the rear and a 5-megapixel f/2.0 selfie shooter on the front. The entire setup is said to be run by 4,000mAh battery with standard 5W charging. Lastly, the Galaxy A10 will have a dedicated microSD card slot, dual VoLTE support, and colour options: Black and Gold. 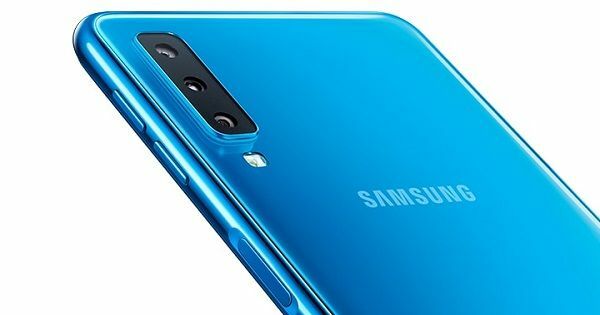 The Galaxy A30 and Galaxy A50 smartphones, on the other hand, are said to ship with 3D Glossy plastic design and 6.4-inch Infinity U display with FHD+ (1,080 x 2,340). They’ll both be arriving in Black, White, and Blue shades, and house a whopping 4,000mAh battery with 15W fast charging tech. The major differences between the two devices are going to be chipset, configurations, and cameras. The Galaxy A50 will be slightly superior with 2.3GHz octa-core Exynos 9610 SoC ticking at its core. It’s expected to offer up to 6GB RAM and 128GB storage options – the latter is expandable up to 512GB by adding a microSD card. In optics, the Galaxy A50 is reported to feature triple 25-megapixel (f/1.7) + 5-megapixel (f/2.2 depth) + 8-megapixel (f/2.4 ultra-wide) rear cameras with LED flash. The punch hole on the display is likely to house a 25-megapixel (f/2.0) selfie shooter. As for Galaxy A30, the handset will be powered by octa-core Exynos 7904 chipset, accompanied by 3GB/ 4GB and 32GB/ 64GB storage (expandable up to 512GB). For photography, it’s likely to arrive with dual 16-megapixel (f/1.9) + 5-megapixel (f/2.2) rear cameras and 16-megapixel (f/1.9) snapper on the front for selfies. Both the smartphones – the Galaxy A30 and A50, will boast of pixel merging, background blur, scene optimiser, flaw detection, smart beauty, selfie focus, AR stickers, and pro lighting mode. Their other features may include Samsung Pay-Mini, Bixby, Dolby Atmos, dual-VoLTE support, and USB Type-C port for charging and money transfer.